The Standing Stone: Manger, Cist Tomb, Co. Laois. Manger, Cist Tomb, Co. Laois. Location – OS: S 597 872 (map 61). Located not far from where the N80 and N78 intersect. 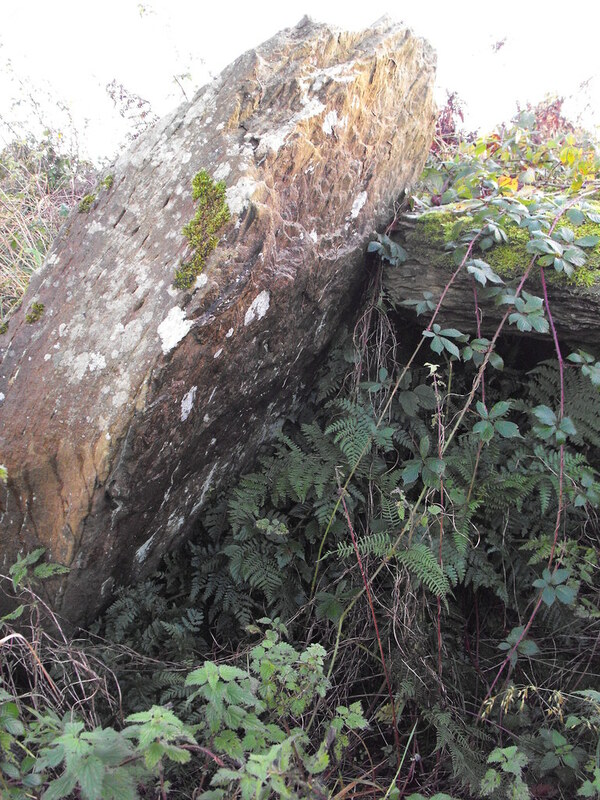 Description and History – I particularly like this site, mainly because it is the only megalithic site of worth that I have found in county Laois. However, it is still a worthwhile site in its own right even though it is largely ruined. 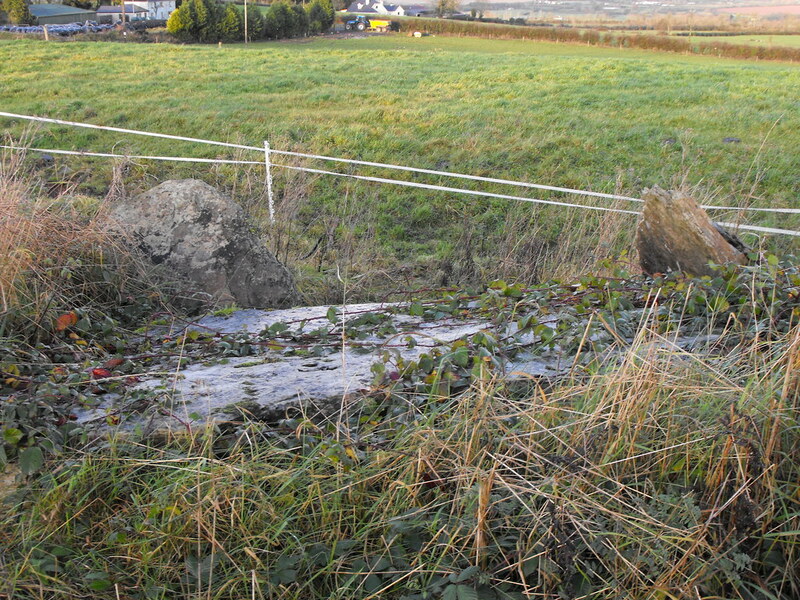 The cist tomb is now wedged between a field fence and the road and is largely forgotten about. In fact you could drive and walk by it without even knowing it was there. A large stone slab 2.5m x 2.2m and about 0.3m deep rest on some small orthostats and a drystone wall at the rear. The slab has slipped somewhat but you can still see what it must have been like. The chamber is about 0.8m deep. The tomb sits at the edge of a now in-filled quarry and faces the NE. As with many cists this was once underneath a barrow or cairn but this has been removed, probably during quarrying activity. It has been reported that many other cists were scattered nearby but have been removed. The site may have been of some importance and much larger. 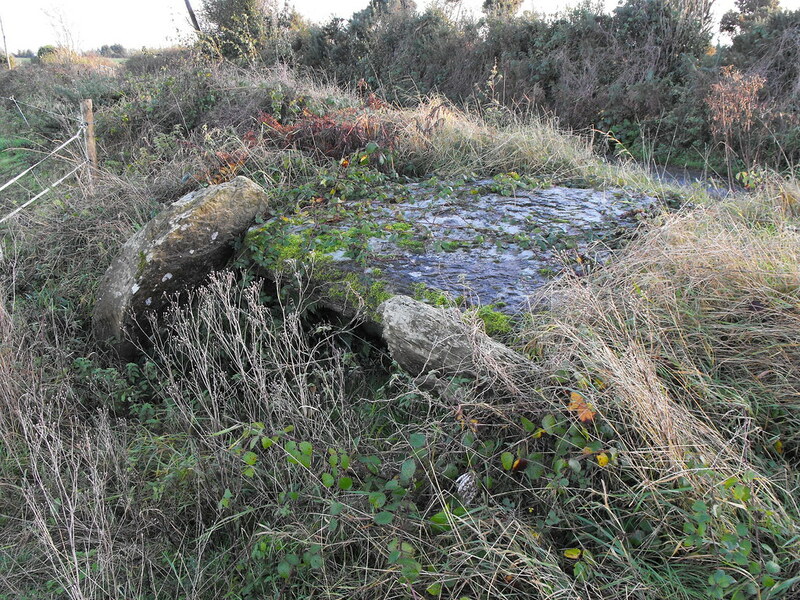 An account of the site from 1849 says that this tomb was buried and surrounded by a kerb of standing stones. It is sad that what was obviously such an impressive burial monument that was still intact 150 years ago is now ruined and left to fall to pieces on the side of a country lane. Difficulty – This tomb is right on the side of the road but can be easily passed, particularly in the summer months. Keep your eyes peeled. The supporting orthostat. Note that the slab has fallen off the stone. 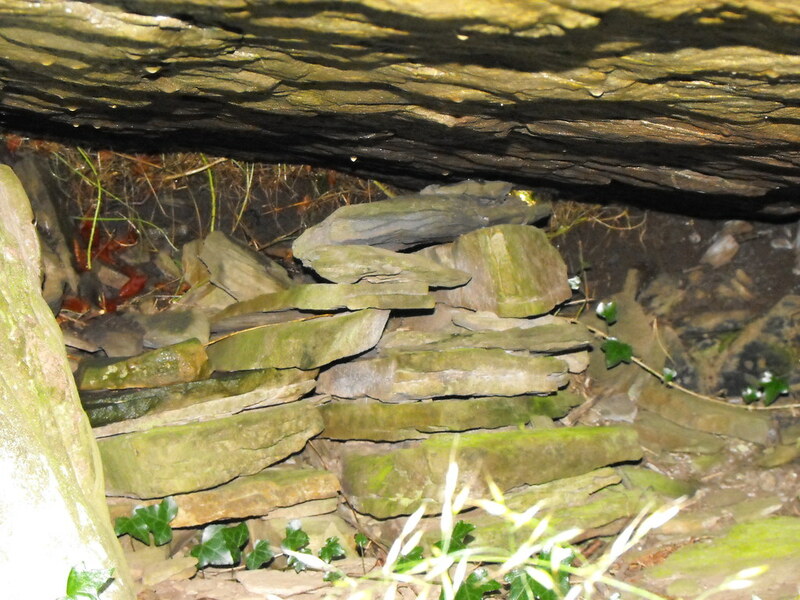 The dry stone walling inside the chamber.